Today I went for another hike. This hike, the Los Robles Loop in the Los Padres National Forest, is what I consider an Urban hike. The trail starts in a suburban neighborhood and winds it way up into the hills. Most of the views are of the mountains or the city of Thousand Oaks and highway 101 that passes through it. While the hike is a nice one, the experience is diminished somewhat by the constant hum of the freeway traffic. I was hoping that would fade into the background once I moved into the valleys but it never completely went away. "Sherwood Forest" : A cleverly hidden micro-cache. This was a round altoid tin that was attached to the bottom of a rotting log. Micro-caches, called micro because of their small size, can be hard to locate because there are so many places they can be hidden. "The Retirement Plan" : This was yet another clever cache. The hider had woven a bird's nest and zip tied the nest to a tree (Get it? Nest Egg ... The Retirement Plan?!). There was nothing in the nest. I assume that it was raided either by wild animals or dumb humans. Still, it was a cool cache. 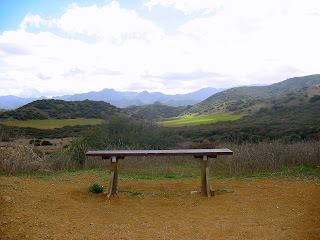 "The Bench" : This cache was located near a bench located at the top of a ridge that overlooked the city on one size and the hills and fields on the other. The picture above is of the lonely bench. I sat and rested on the bench for a bit and took in the views. The cache was located about 75 feet from the bench. I took the Geocoin called "chaosmanor's Golden State - Gold #2" A Geocoin is a numbered token that can be tracked similar to the Travel Bug I have mentioned before. The geocoin is shaped like the state of California. I will move it along on my next hike. I placed the NASCAR Rules! travel bug that I picked up in the Arroyo Verde Park in the cache. "Know Strings Attached" : Yet another clever hide. This micro-cache was suspended down a hollow branch - you had to pull the cache up by the string. "Sugar Sweet Smell" : A simple hide. Nothing special. "The Pine Something" : This one was a plastic thing that looked like a cross between a pine cone and a pineapple. The hider cut out the bottom and glued a film cannister in it. The whole thing was handing from a tree branch. A good hide. "The Quiet Canyon #1" : This one was a mystery. It was supposed to be a camouflaged ammo can but all I found was a plastic ziploc bag full of geo-treasures. I guess someone liked the ammo box more then the stuff inside. "The Quiet Canyon #2" : This one was another simple one. A family came by while I was looking through the cache. Not sure what they thought. I hope they didn't think I was taking a dump or something. "1,2,3,4 ...?" : This one pissed me off. It was easy to find but it was hard to find the log. The plastic container was filled with film cannisters (many film cannisters) and it took me a while to find the one with the log. This was supposed to be fun - I just found it annoying. To make it worse, the log was in the last one I opened. Sigh. "Oxymoron" : The last one was also a Micro-cache (The fifth one on the hike). It was also hanging in a bush. For some reason the hanging ones are the hardest to find. It took me awhile to find. Even with the encroaching civilization, I enjoyed the hike and the caches. This hike was supposed to be 3.1 miles long but I stretched it out to 5.58 miles with all the spurs I took to find the caches. I can't wait for the next hike next weekend. I am planning to do another hike tomorrow afternoon and I am planning to drop off the Travel bug that I am currently holding, "NASCAR Rules!". The wife bought me a set of travel bug dog tags a while back and I created "The Mind Wanders ..." travel bug. I had a sponge rubber brain that I received as some advertising promotion so I poked a hole through the brain and threaded the dog tag chain through it. 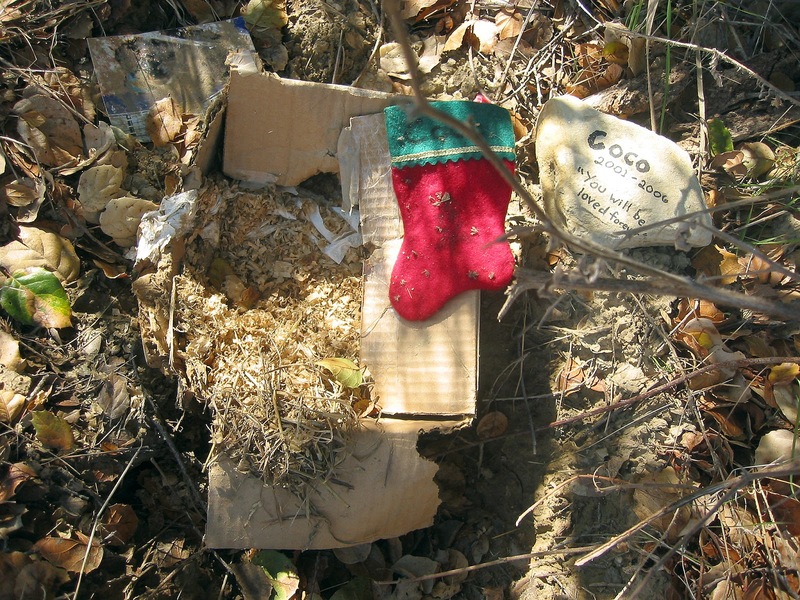 I placed the bug in the "Chupy 7: The Grandparents" cache in January 2003. Over the next three years "The Mind Wanders ..." traveled 6,389.8 miles. You can see the path it took here. Unfortunately the last person who took it never signed it in and the Mind has finally wandered too far. It has gone missing for over a year now. I am considering buying more tags and starting some more bugs. A while back I posed the question: "Should I advertise on my Blog?" I received only one response. That response, from a certain New Yorker, said "No advertisements!" I decided at the time to respect that vote and I have not advertised on Homer's Travels. Well, to my surprise, said New Yorker told the wife on the phone that he was offered bookoo bucks to advertise on his blog and he is considering the offer. I think I will have to reconsider advertising on Homer's Travels now that the only vote is flip-flopping. The New Yorker is the Godson and, while he hasn't asked for my opinion I'll give it anyway, I think he should accept the offer if he can confirm its legitimacy. I skipped this trip when I was putting together the vacation installments. This one was in August 2002. We drove to Vegas to go to a Lenny Kravitz concert at the Mandalay Bay Hotel. This was the first time we stayed on the strip - The Luxor. Unfortunately, on the way to Vegas we stopped in Barstow to eat lunch at Bun Boy. I don't remember what I had but the wife had a Taco Salad - the Taco Salad from HECK! That night we went to the concert and the Taco Salad attacked resulting in some quality time in the public toilet for the wife. Despite this unfortunate circumstance, we both enjoyed the concert. Pink warmed up for Lenny. She surprised me. I had heard little of Pink before this and my uninformed impressions was that she was a pop throw away teen queen. I was in error. She was hot and had a great set of pipes. She did a Janice Joplin medley that truly impressed me. (I came home and bought, and liked, a couple of her CDs.) Lenny, of course, was great. Pink made a bigger impact on me because her talent was unexpected. I thought Lenny was great before the concert and his show confirmed my beliefs but it wasn't a surprise. The next day, the wife still didn't feel well so she stayed in the room. I went for a walk but the temperature - in the 100s - cut my stroll short. I should have gone to the pool to cool off but it didn't feel right without the wife. Later the day, the wife was feeling a little better and we went to see Blue Man Group. The show was good but not great. That was our last trip to Vegas. I'm sure there are more in the future since we like the shows. Next time though no Bun Boy. Sunday, the "J", the wife, and I got back in the car and headed south again, this time to visit three missions - San Diego, San Luis Rey, and San Juan Capistrano. We miscalculated the time needed and we did not visit San Juan Capistrano. Oh well, another roadtrip is in our future. We left our house at 9:00 and made it down to San Diego before Noon. Mass was still going on at Mission San Diego de Alcala so we found a Chili's nearby and stopped to eat lunch. After our yummy lunch we went back to the Mission and toured, took pictures, and shopped the gift shop. This was the first mission established by Padre Junipero Serra. The mission was similar to the other urban missions we had visited before. While I like going to the missions, they are starting to look the same. The pictures are here. We left San Diego and drove north to Oceanside, CA to visit San Luis Rey. This Mission was more impressive. 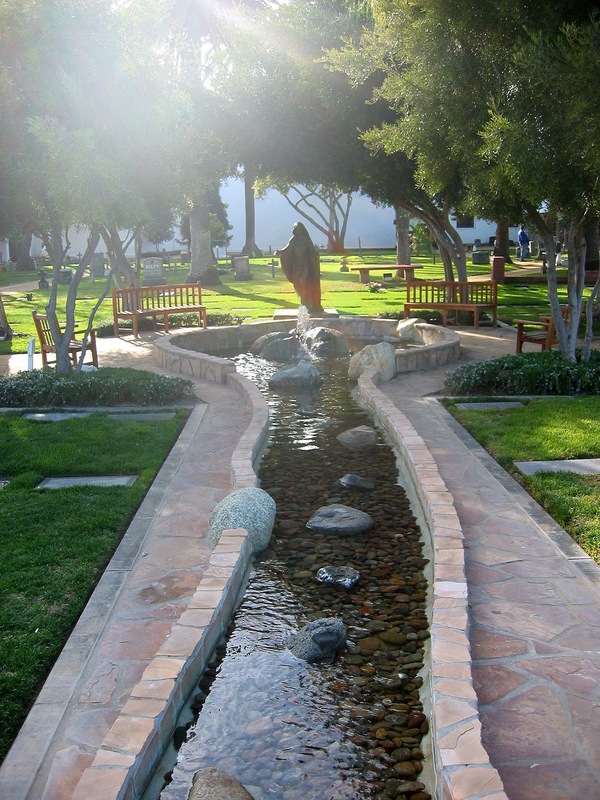 We toured the Mission grounds and soon realized that the Mission would soon be closed. We finished the tour, took some pictures, and ... shopped the gift shop. Pictures are here. We headed for San Juan Capistrano but realized that we weren't going to make it. We decided to reschedule this visit for a later date. I am also looking at going to Mission Nuestro Senora de la Soledad and Mission San Carlos Borromeo de Carmel up north. The drive would be around nine hours which doesn't sound so bad since some of our recent roadtrips. So it was Saturday after our 10+ hours in the car. The Santa Ana winds were blowing and the temperature was going to be in the mid-80s. I didn't feel like doing anything but I figured if I sat around I would not be happy with myself so I drug myself out of the house and drove up to the Matilija Canyon to do a hike. The heat was not as bad as I expected - the warm breeze actually felt cool and refreshing. I actually had everything I needed today - hat, water, bug spray, walking stick - I think I finally have this hiking thing figured out. 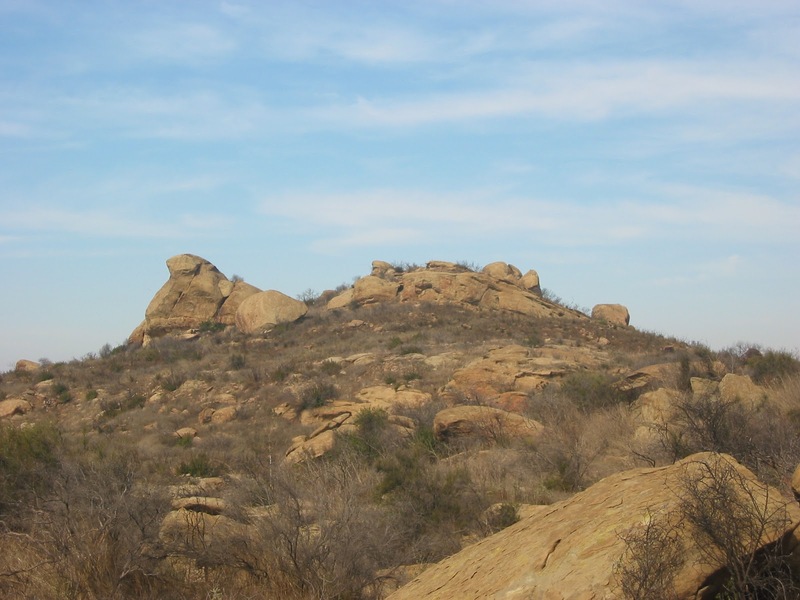 There are a couple of hiking trails starting from the Matilija Canyon Ranch Wildlife Refuge. 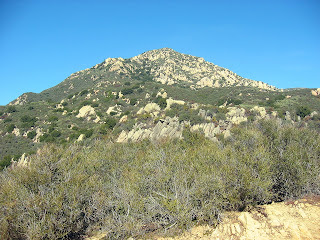 One is the Matilija Trail which I have done part of twice before. The entire trail is around 10 miles - too much for me (I do plan to do a long portion of it in sometime this year after I've built up my hiking range). The second trail is the Murietta Trail. 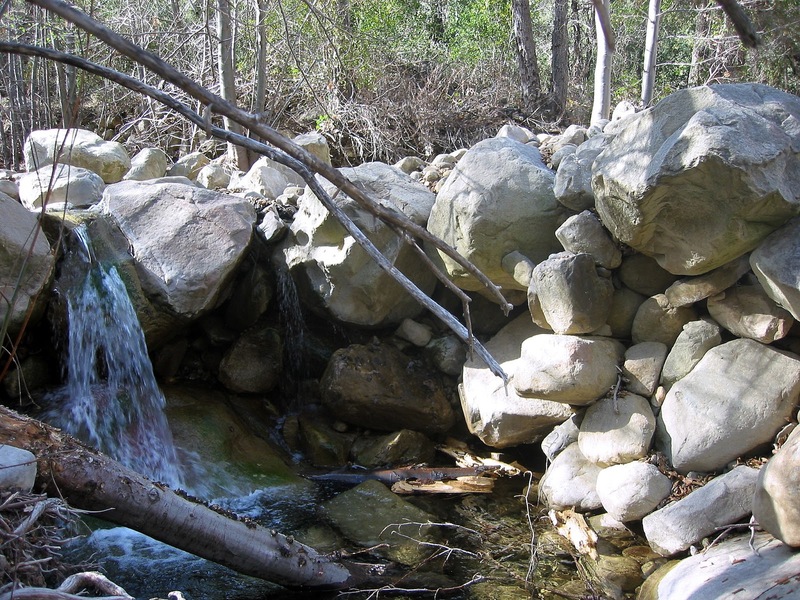 The Murietta Trail is about 3.6 miles long and takes you along the Murietta Creek. There were no Geocaches on this trail - strange since there are at least nine on the Matilija Trail. The trail, creek, and the camp located along the trail is named after Joaquin Murietta who was, or may have been, a Mexican Bandit who may have used the valley as a hideout. There apparently are many tall tails about Joaquin Murietta and no one really knows the whole truth. There were several cars at the trailhead but nobody on the Murietta Trail. I guess everyone was on the Matilija Trail. This was fine with me since I like to be alone when I hike. The purpose of hiking, for me, is exercise and tranquility - the trail furnishes the exercise and the lack of people, the tranquility. The trail crosses a couple of creeks several times. One of the great pleasures in life is hiking along running water. The gurgling flow of the water is one of the most relaxing sounds I know. The only disadvantage of water near trails are the swarms of insects that tend to be in the area. I swatted my way to the Murietta camp. I still felt pretty good so I kept on going. The trail came out to a road. I could either turn left which would have taken me to Murietta Divide (I did not know this at the time - I found out after I got home), turn right and follow the road back to the trailhead, or turn around and follow the trail back. I usually like to do loops if I can but this time, the trail appeared more interesting than the road so, after I had rested, I turned around and headed back down the trail . I stopped at a particularly interesting creek crossing and sat in the shade listening to the water. Water Striders were flitting across the surface where the water pooled. The gnats didn't bother me here for some reason. It was very relaxing and darn near perfect. I made my way back to the car. The ranch had some peacocks in a pen but they were too far away to get a picture. There are a lot of Peacock's in the Ojai, CA area. I scritched a pug's back - She seem to enjoy it - before I loaded my gear into the trunk of my car and headed home. Here are a few pictures. So, on Friday we did our big 10+ hour roadtrip. The "J" showed up at 7:30 am, we loaded up the car with water and snacks and headed south. Our route took us through Los Angeles, past the Salton Sea, and nearly to the Mexican and Arizonan borders. We had a great time. The "J" provided the snacks and witty repartee (HHAAAAYYYY!!! ... Well, you had to Bee there Honey to get this joke but the Drone of our Buzz made us all laugh). The first of our two destinations was Felicity, CA, location of the Official Center Of The World. The "town" of Felicity was founded on 11 March 1986 by Jacques-Andre Istel. The town was named after his Chinese wife Felicia. 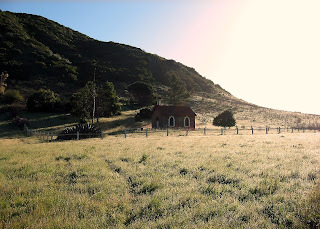 There is too much to explain in this post so follow the links and discover the wonder that is Felicity, CA. Besides being the center of the world, Felicity is home to marble memorials to the Korean War, The French Foreign Legion, The History of Flight (Especially Parachuting), and the History of the World in general. There is a section of the Eiffel Tower's stair case. 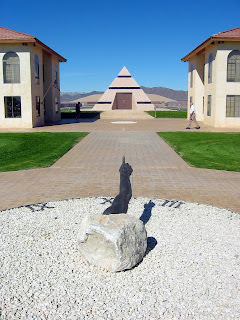 The main attraction is the center of the world marked by a metal disk in a pyramid. The arm of a sundial, an arm modeled after the arm of God from the Sistine Chapel I might add, points to the pyramid, the memorials, and the Hill of Prayer beyond where a Church is being built. We arrived at lunch time so we decided to have a sandwich at the Restaurant at the Center of the World. We were a little surprised by the our hostess - Felicity herself! After lunch we looked through the gift shop - and a more eclectic gift shop the world has never seen - while we waited for the next tour. 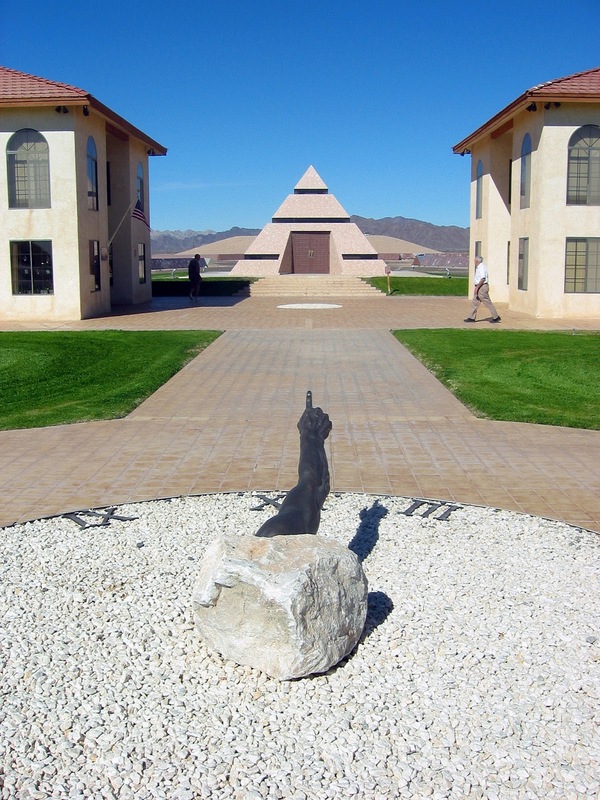 Tours ($2.00 per person) let you enter the pyramid, stand on the exact center, and receive your certificate. You can often get your picture taken with the Mayor but today he was busy with a big celebration that was going to take place on Saturday (Darn it!). We watched the DVD about the founding of the town and how the idea came from a children's book written by the Mayor before we entered the pyramid and stood on the center. We walked around the marble memorials before we raided the gift shop. Many of the memorials in this mish-mash collection of tributes are still incomplete. I am sure that if we went back in 10 years it would still be incomplete. I wonder, will it survive the passing of the founders? Pictures are here. There was a news crew in Felicity. They asked if any of us wanted to give an interview but we all chickened out and said no. We were filmed while we stood on the center. The second destination was near Niland, CA. 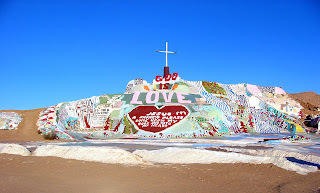 - Salvation Mountain. This was actually quite impressive. 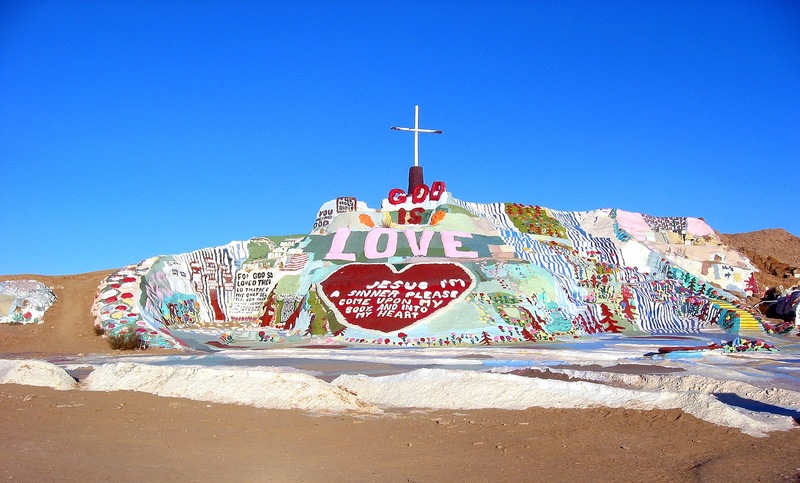 Leonard Knight had built (from Adobe) and painted a colorful monument to God's Love. Everywhere you look there are little details that fascinate and inspire awe. Even his cars, truck, and tractor are painted and decorated. The sun was at the perfect angle and the entire "mountain" was shining. We walked around and, in some sections, in the sculpture. The inside was filled with a web of brightly painted log and branches - All just fascinating. Our luck was a little bad here in that we just missed Leonard who was in town. We donated some paint that we had at the house. More pictures are here. The drive home was mostly in the dark. It was a very long day. I let the wife take over the driving after we ate at In N Out. The drive was too long but we all had a wonderful time. I had a great time. This goes to show that your destination does not always have to be serious to be satisfying. Sometimes we all need some cheeseball. Last Saturday I went to Blockbuster to pick up a free DVD. I was standing in line when I was witness to weirdness. The customer at the counter was a loud talking, upper 30s man with a walker and a parrot on his shoulder. This was ironic since at the time I was holding Pirates of the Caribbean: Dead Man's Chest. The weirdness reached a crescendo when he asked the checker if she had a moist towelette. She directed him to the bathroom. As he made his way to the bathroom you could see that both shoulders, front and back, was streaked with bird droppings. Oh the perils of parrot ownership - Parrot Poop. His wife just stood by the door rolling her eyes and looking slightly embarrassed. The wife (mine) always said that she attracted weird people (which explains me) and I guess her condition has rubbed off on me. Upcoming Stuff ... Cool ... Bizarre ... Cheeseball! The past month or so has been bereft of cool stuff to do. After the previous six month full of cool roadtrips and exploring new places, January felt like a slow stumble across the Mojave. Things are starting to look up though. Along with the hikes that I am starting to do (See here, here, here, and here), we have a couple of roadtrips set up for Presidents Day weekend and a tickets to a show scheduled for when the Matron-of-Honor and the Alter Boy visit. First the roadtrips. One of the trips will be a continuation of our Mission mission with a visit to the three missions located south of here. 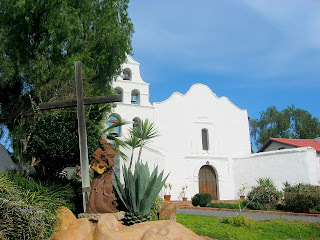 We will be driving to San Diego, possibly visiting with friends there (time permitting) before we hit the Mission San Diego, Mission San Luis Rey, and Mission San Juan Capistrano. The second roadtrip is a little bizarre and I am going to keep it under wraps until I'm ready to post about it. It's going to be a long one - over 10 hours on the road - we will attempt to hit two potentially cool, definitely bizarre, and with a high probability of being the most cheeseball places we have ever visited intentionally. This, of course, is perfect for the me since cool, bizarre, and cheeseball are some of my favorite descriptors. Well, actually cool, bizarre, and weird are my favorites but cheeseball ranks a close fourth when accompanied by cool. I'm sure the wife agrees. The "J" has signed up for both trips meaning that the conversation in the car will be delightful and the time will pass by with a whoosh. Now the tickets. The Matron-of-Honor and her son, the Altar Boy (The wife suggested this nickname - talk to her. Oh yeah, later this year it will be Mr. and Mrs. Altar Boy - Congrats! ), will be visiting in March and I have scored 4 tickets to Royce Hall down in UCLA for a live taping of This American Life. How cool is that! I've been hooked for a while and I've been trying to listen to at lease one episode a week (I managed two today) and I got the wife hooked as well. I have burned copies of episodes on a CD so she could listen at school during her prep. period. They will be recording a show and they will be screening a preview of the new This American Life television show. I hope these events will restart our trips. It also helps that we are both healthy again. Well, the rain was delayed so I decided to squeeze in a nearby hike. The Matilija Trail I was going to do was too far and the chances of getting caught in the rain far away from the car was too high. 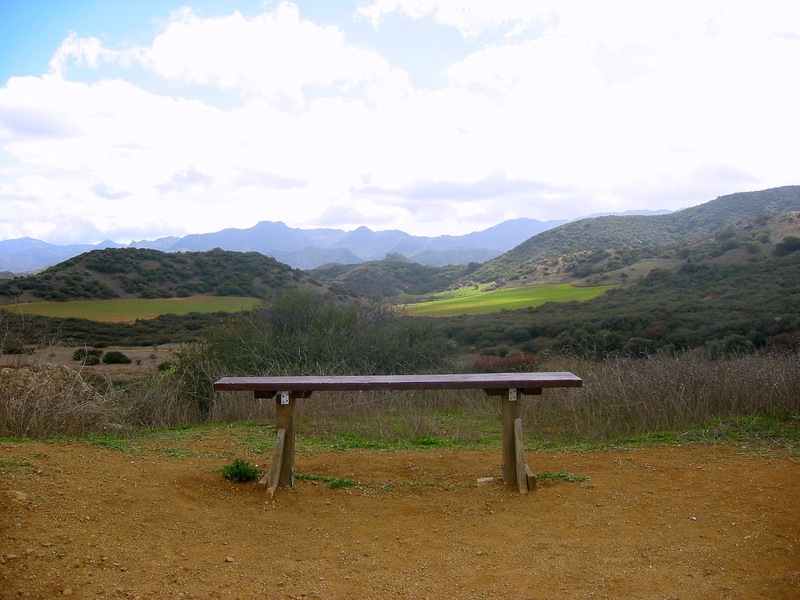 Instead, I headed for the Arroyo Verde Park in the hills overlooking Ventura and did a hike there. I have hiked this trail two times before. I had debated not doing hikes that I have already done but, after checking for nearby geocaches, I located eight along the trails that I had not done so off I went. The skies were still blue when I got there and I warmed up quickly while I hiked. I remembered my bug spray this time but ... I forgot the darn water AGAIN! I do not know what my problem is. Anyway the trail is about three miles long. I managed to stretch it out to 3.81 miles. The extra distance is probably due to the caches I hunted since many of them were located on spurs off the main trail that added a little distance. The trail is a dirt trail that climbs up in the hills. Since our rain levels are still low, most of the vegetation is still brown and dry. The cacti seemed healthy. As I worked on the caches I eventually got off the main trail and bushwhacked up to the top of the park that borders a small avocado grove. There were a lot of dead avocados on the ground - victims of the brief freeze we had in January. I made my way back to the car and bought some water before heading back home. "Ventura Toy Cache" : This was the first. My GPS was off by 40 ft but the hiding spot, a large tree, was kind of obvious. There was a baseball in the cache that you could sign - I signed it. A lady saw me while I was looking at the cache. I waved at her so she wouldn't think I was spying on her or something - kind of awkward. "Iraq" : This cache gave me trouble. I got to the coordinates and saw a rock that looked like the hiding place. I looked under it and found a paint can opener bu no cache. I looked around some more but kept coming back to the rock. Finally, after looking at the rock for the third time, I looked at the underside of the rock. The hider had carved a hole in the bottom of the rock and glued in an altoid tin. There was also a magnet that was suppose to keep the paint can opener held to the rock. The opener was need to open the tight fitting tin. I signed the log. "Island Grenade" : This is another cache from the guy who hid the Iraq cache. The cache a small can with a lid that was disguised as a pineapple. It wasn't too hard to find. In this cache a found a travel bug. A travel bug is an object with a numbered dog tag connected to it that allows cachers to track the item as it moves around from cache to cache. This one was called NASCAR Rules! I will put it in another cache on a future hike. I left a couple of super balls in the cache. "Iran" : This cache was a plastic cylinder stuck in an old tennis shoe. It was hidden on a narrow, 10-12 ft wide ridge. Nice view. The contents were a little damp. "Danger Explosives" : This one was really clever. Hidden by the same guy who hid Iraq, Island Granade, and Iran, this one was disguised as a no trespassing sign hanging from a barbed wire fence. I stared straight at it several times before I realized it opened up like a book and there was a sheet of paper inside for the log. Signed the log. "The Last Shall Be First..." : This was an easy micro cache. Nothing special. Signed the log.
" Toy Soldiers" : A container full of toy soldiers. I signed the log. "Log This" : This was the last cache of the hike. While I was looking for it I came upon a cardboard box full of wood chips half buried in the ground. The box was torn open and there was a small Christmas stocking on top of the box with the name Coco written on it. Next to the box was a stone with the name Coco and the words "You will be loved forever 2001 - 2006." I'm not sure what is sadder - the death of a beloved family pet or the fact that it's body was carried off by some wild animal. The cache was nearby, under some logs and I signed the log. It is now the evening and the rain still isn't here. They just can't forecast weather out here. I was planning to do the Matilija Creek Trail this weekend. There are eight geocaches along the trail but I don't think all of them are within my range. It looks like the total hike is about nine miles but there are about four or five caches within my hiking capability. Unfortunately I won't get the chance this weekend because of the rain in the forecast. Oh well, maybe next weekend. The next installment is a slight deviation from past installments in that it really wasn't a vacation. In March 2003, the wife and I helped chaperon a group of students on a field trip to Santa Cruz island, one of the Channel Islands. We took a boat out to the island . Once we arrived we hiked the two - three miles to the house we were going to spend the night at. The house is owned by the Nature Conservancy. Everything is solar powered. There were semi-truck sized solar arrays that the conservancy received from the Navy. The Navy has a radar facility on the island and when then upgraded to larger solar arrays they donated the old ones to the nature conservancy. We had about 24 students along with 6 chaperons. We had a great time with the kids. The first night was mostly S'mores, eating, and other fun stuff. The next morning, after a chilly night, we got up and walked down along the farm buildings that were built by the original owners of the land (The solar panels are the three small gray rectangles in the lower middle of the picture) . Some of the buildings were built in the 1880- 1890s. 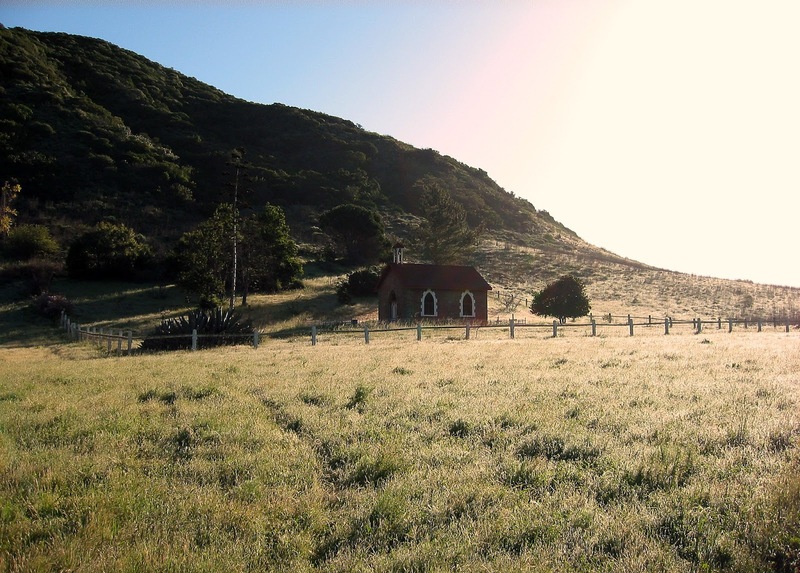 The long grass of the meadow that surrounded the small family chapel glistened in the morning dew (The chapel is in the upper right of the complex out by itself). After breakfast we did a short hike to some waterfalls and had fun climbing the rocks in the area before we headed back to the beach to catch our ride back to the mainland. It was a fun little excursion. A few more pictures here. 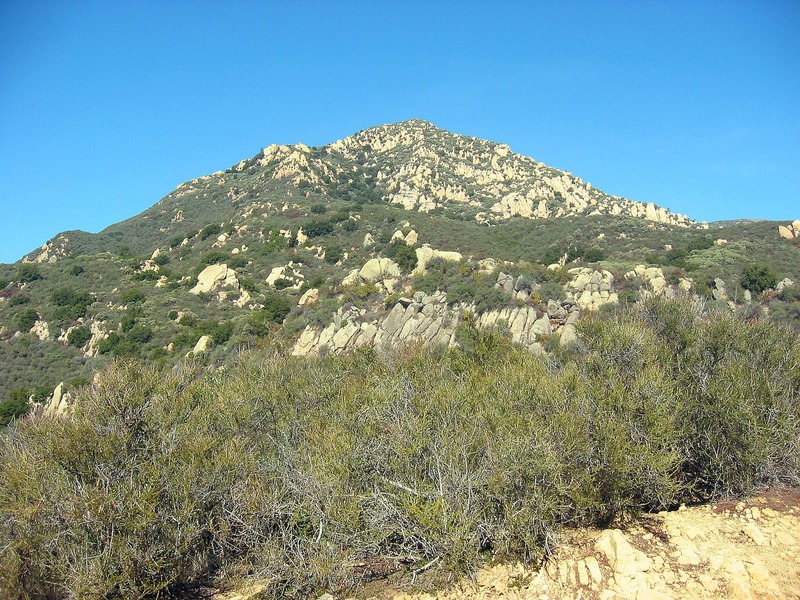 This morning I realized that there is another thing you need when you hike the Ventura hills - insect repellent. I felt something on the back of my left shoulder. I looked in the mirror and saw a blood red spot. Being the person that I am, I started picking at it. That's when I saw the wiggling legs - a Tick. The wife, between making sounds of disgust and suppressing her gag reflex, managed to remove it and we filled the hole with antibiotic first aid gunk. I've been feeling all itchy and paranoid all day. From now on insect repellent is my friend. Right off the bat I have to confess that this post is mis-named. This hike was actually in Santa Barbara County. That said, It was a very good hike. The hike to the seven falls area is a 2.5 mile round trip trek. By adding inspiration point to the hike I added about 2.35 miles for a total of 4.85 miles. Inspiration point also added about 800 ft of vertical climb to the hike. The weather was spectacular and this time I had my water and my walking stick. My hat, of the other hand, was back home. I thought it was in the trunk of my car but I was wrong ... sigh. Anyway, parking near the trailhead absolutely sucked. I drove back and forth and almost gave up when a spot opened up. I actually parallel parked for the first time in about 20 years - perfect on the first try I may add. Parallel parking for me is a great achievement. The parking spot was also only 20 feet from the trailhead - score! The cars hinted at a crowded hike and there were quite a few people with their dogs walking the trail. A small bull terrier either tried to hump my leg or wanted me to pick it up and carry it the rest of the way. Soon afterward I misread the directions and went up the wrong trail. I knew it was wrong because it soon disappeared and I was bushwhacking. I wore myself out getting back to the trail. Fortunately my wrong turn took me in the right direction so I didn't have to back track or anything. "The Point Of Inspiration" : This cache was on a small side path off of the main trail. At times the path looked like a tunnel made of trees and brush - real cool looking. 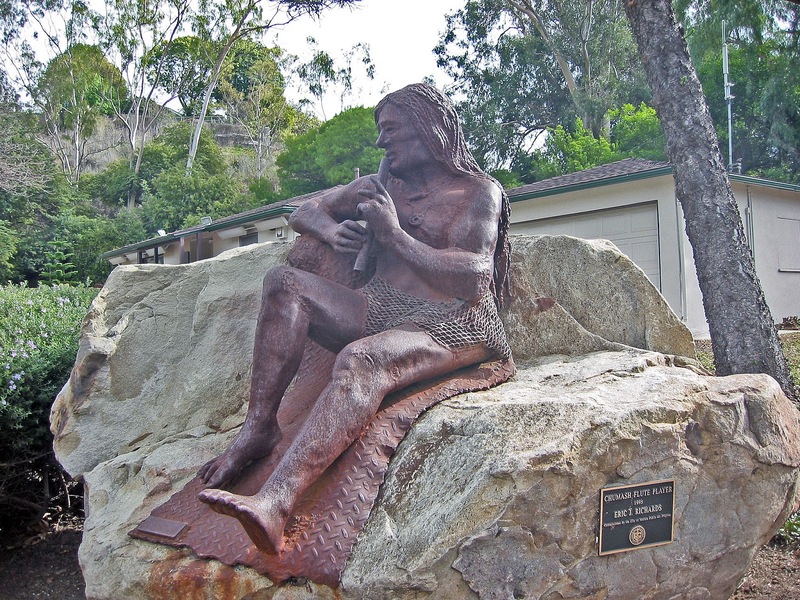 The cache was hidden among some boulders with views of Santa Barbara and the surrounding mountains. "Under The Wire" : This cache was nearby and located at the base of a power line tower. My GPS was off by quite a bit (55 ft) but the name of the cache pretty much says it all. After leaving the cache I realized I didn't have my walking stick with me - damn! I had to back track a little and I found it near the second cache. A good walking stick is hard to find. I had found this one a few years back on the Punch Bowl trail. Right length, right diameter, and straight. I made my way back down to the falls area and scramble over the boulders to the pools. I had hoped that the rain we got last week would have resulted in good falls. It didn't turn out that way. The pools were full but the creek was not flowing. I guess it's been too dry this season. "Caretaker's Abode" : The cache was located where the tunnel's caretaker used to live. The house was destroyed in a fire back in 1964. Only a few stone walls survive. It took a while to find the cache - the GPS was jumping all over the place. I finally found it and signed the log. The walk back to the car was uneventful. I drove some back roads past estates and mansions on the way home. A nice hike and a nice drive home. A few pictures are here. "On The Rocks" : This cache was located on an outcropping of sandstone and the views from the stone was awesome. This was an easy find. As I examined the cache contents a coast guard helicopter flew overhead - I waved. I decided not to exchange treasures and I just signed the log. On the top of the rock there was a white 'X' painted on the stone - not sure why. "Center Sage" : This one was located near the campgrounds located in the center of the park. Another easy find. After signing the log I decided to not not return the way I came and I headed cross-country bushwhacking style. Not a smart idea. It would have been easier and probably quicker to back track. I worked up a sweat making my way back to the loop trail. "Turtle Soup" : This cache was named for nearby Turtle Rock. The coordinates were off - 26 ft off - but I was able to find it rather easily. Searching for caches is a two phase process - phase (1): Go to the coordinates and phase (2) Ask yourself: "If I was hiding a cache, where would I hide it?" In this case phase (2) led me straight to the cache. Signed the log and moved on to the next cache. "Sage Ranch Park" : OK, this is a cool cache. It is located on a high sandstone ridge called ... wait for it ... Sandstone Ridge! The park is on one side and what looks like a ranch is on the other. I'm not sure about that since there is also a Boeing facility over there but I saw Horsies grazing near the bottom of the ridge so it must be a someone's private property. I walked along the ridge a little bit. Found a round depression cut into the stone that is either the location of an old water tank or a landing site for flying saucers - hmmm? Boeing Flying Saucers??? Signed the log and neighed at the horsies. "Space Mountain" : I nearly tripped over this cache. It wasn't hid very well so it was easy to find. The contents were charred and melted. There is a lot of evidence of recent fire in this park and a couple of the caches were subject to some intense heat. A lot of the plastic items in the caches have indications of some melting. The cache has a space theme because of the Boeing plant next door. Signed the log and sauntered to the next cache. "Bring Your Lunch" : This one frustrated me a little bit. I looked all over the place. I found a dead owl nearby but no cache. There were plenty of places to hide the cache so I looked all over until I finally sat down at a nearby picnic table and read the cache clues a little closer. Each cache page has an encrypted clue. I decided to decipher this one since I was a little frustrated. The clue said "No Clue Needed." Then it dawned on me and I looked under the picnic table. Attached to the bench, right under where I was sitting, was a small film canister. These are usually called micro-caches because of their small size. I signed the log and headed for the last cache on the loop. "I'm A Bit Grouchy" : The last cache wasn't too hard to find. I looked in the obvious places a bit before I finally found is a few feet away. I signed the log and then made my way up the hill back to where the car was parked. I learned (or re-learned) a few things on this hike. First, always take water. I was planning to take water but I realized I had forgotten it after I was on the trail and thirsty - too late. Second, a good walking stick is always handy to have. Some of the lichen of the rocks was slippery and the walking stick I had in the trunk of my car would have helped greatly. Third, no matter how cool it is or how cloudy, you should always bring a hat - mine was in the trunk of my car next to the walking stick. I was also going to download the GPS track and link to it in Homer's Travels but I set up the GPS wrong (It's been a while since I used it) and I don't have a track - d'oh! Maybe next time.There are more pictures here. I stopped at In-And-Out Burger in Moorpark on the way home and rehydrated myself. Tomorrow, if my legs feel up to it, I will tackle the Seven Falls trail. It too is a 2.5 mile hike but I plan to lengthen it by doing three geocaches in the area.